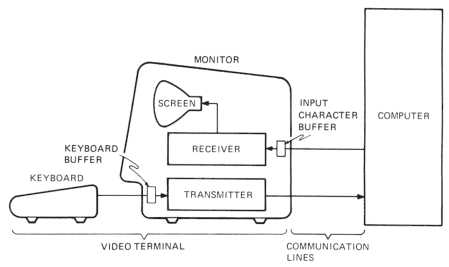 In video terminals, like the VT100, can control characters and escape sequences only be sent by an application from the host computer to the terminal? Or can they also be sent directly by the user from the keyboard to the terminal? That is, the user controlling the terminal from the keyboard, rather than an application controlling the terminal from the host computer? 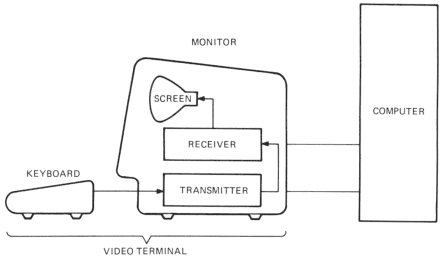 I'm trying to understand how video terminals worked by the example of the VT100 family. I found the following diagram of a VT102 in the VT102 user guide (Figure 1-1). I assume that on the computer-side of the communication line, there is a driver for this type of terminal, and behind the driver there is an application that reads its input from the terminal and writes its output to the terminal (through the driver). This application might be a shell, or any other application that needs to get input from the user and/or show output to the user. When a user of the terminal types a character on the keyboard, this character is immediately transmitted to the computer (i.e. the VT100 family uses character-at-a-time mode, there is no local processing of characters entered by the user). The receiving application on the computer can then read this character from the terminal driver and do with it whatever it has to do with it. Every character that the writes to its output (which is the terminal driver) is sent to the terminal where it is displayed on the screen (except control characters and escape sequences, see below). If the application-specific purpose of a character sent from the terminal to the application is such that the user should see it on the screen, then the application must send this character back to the terminal so that it gets displayed on the terminal screen. That is, the VT100 family uses, in most cases, no local echo However, for the VT102, local echo is a setting that can be enabled, see here. This becomes obvious if the application on the computer is something like vi. There, not all characters that the user types must appear on the screen. In particular, characters typed in command mode must not be displayed, whereas characters typed in insert mode must be displayed. This modes are application-specific and neither the terminal nor the terminal driver could know if a given typed character should be displayed or not. So, in these cases, it must be the application that controls the display of user-typed characters. First of all, are these assumptions correct? Now to the question. The terminal understands and interprets certain control characters and escape sequences that can be sent from the computer to the terminal. Each of them has an associated control function (e.g. move the cursor on the terminal screen). When the terminal receives such a control character or escape sequence, it does not display it, but executes the associated control function. This stands in contrast to the display characters (non-control characters and not part of an escape sequence) which the terminal just displays on the screen when it receives them. Control characters, escape sequences, and display characters can be intermixed in any way (there is only a single transmission line from the computer to the terminal anyway). All the control characters and escape sequences that the VT102 understands are explained in the Received Character Processing section of the VT102 user guide. Control characters are ASCII control characters. The set of control characters understood by the VT10, including the associated control functions, is listed here. Escape sequences are sequences of characters that start with a special "escape character". The escape sequences understood by the VT102 are the ANSI escape sequences, and they are described in the Escape and Control Sequences section of the VT102 user guide. They always start with the ESC character followed by some other characters. Control functions associated with VT102 control characters and escape sequences include positioning the cursor on the screen, deleting text on the screen, and setting display attributes (like text colour or font style). This allows applications to control what the user sees on the terminal screen (for example, vi redraws the entire terminal screen when it is started). Now, my question is, are these control characters and escape sequences only meant to be sent from the application to the terminal? Or is there a way that a user enters them directly into the terminal, e.g. via the keyboard? The Transmitted Characters section of the VT102 user guide describes all the characters that can be generated with the keyboard. They include control characters and some escape sequences. Are all these characters always sent to the computer without interpretation by the terminal? For example, if the user hits the ← cursor key, the VT102 user guide says here that this generates the ESC [ D escape sequence. This is the ANSI escape sequence to move the cursor one position back (see here). So, is this escape sequence still sent to the application rather than being interpreted by the terminal? And then the application interprets it and has to send something back to take an appropriate action on the terminal (probably the ESC [ D again)? Or is there a set of control characters or escape sequences that the terminal directly interprets when the user types them on the keyboard (maybe a reduced, different set)? This makes it obvious that in off-line mode anything typed on the keyboard is directly re-routed to the receiver, and thus probably treated as if it would come from the computer. My question was if in on-line mode (see diagram above) any control characters pressed on the keyboard are directly interpreted by the terminal rather than being sent to the computer? Well, as usual with complex matter the answer is a mixture of Yes/If. Yes, the assumptions stated are perfect good and correct. In general. In detail there can be diversions, most depending on line characteristics (like blocking and error correcting modems), and ways the computer/its OS is designed. Yes, there is. And you presented already all parts necessary. No. None at all. Wouldn't make much sense anyway. Either output displayed (characters and operations) is controlled by the host, or the host just interpretes the input, assuming everything the user does is legal anyway - or doesn't care what's displayed anyway. Especially the later may seem strange, but it was quite handy back then to keep programs simple. Why care for stuff a sane user wouldn't do anyway. Originally, the escape character was used to initiate multi-character sequences when it was necessary to support more functions than could be accommodated in 31 active control characters (codes 0x00 and 0x7F were reserved as padding characters that would be ignored). Because some usages would require transmitting that character a lot, a key for transmitting that character was placed at a reasonably convenient spot on the keyboard. Somewhat later, it was discovered that it was useful to have a reasonably-convenient key that would allow a user to "escape" from an operation, and when using interactive applications that didn't need to use the escape character for those other purposes, the escape key was handy for that. Some terminals can be configured so that they key marked Esc will actually send a unique sequence of characters, so an application that detects that can know that escape was pushed. On some such terminals, control-leftbracket can be used to send "just" an escape character should the need arise. Some applications will wait briefly after they receive an escape character to see if it is followed immediately by something else. This approach is quite common and is used by editors like "vi", but is unfortunately unreliable. If a user happens to hit escape to exit insert mode and then starts typing other commands but the application gets momentarily waylaid before it can process the escape, vi might attempt to process some portion of the following commands as an escape sequence (which might in turn disastrously affect the meaning of the succeeding keystrokes). If the user is communicating over a TCP connection which manages to send the escape character from a cursor-right command before a momentary communications hiccup, the application might receive the escape, decide it was "just" the escape key, receive the left bracket, and then receive a "D", potentially leading to major confusion. For applications that interface to a keyboard without having to go through an octet stream, there may be superior ways of handling keyboard input. Under MS-DOS, for example, the "get keystroke" function reports both the ASCII character and the identity of the physical button that was pushed to produce it. This allows for a much wider and more useful range of keystrokes than would be possible using a mere octet stream, but not all operating systems support such things. An ESC character can be represented by the Ctrl-[ key combination. Thus to move one position right you press Ctrl+[, then [ and then C.
Further behavior will depend on where characters go. If they go to remote computer, then that computer will process characters and reply back (e.g. echo) with respective command back to your terminal screen. And I am sure there's a loopback mode when you type characters and terminal shows them on your terminal's screen. Not the answer you're looking for? Browse other questions tagged terminal vt100 escape-codes or ask your own question.